The Magic Clock is a close-up pocket sized miracle. 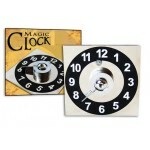 Hand the clock to a spectator and ask he or she to secretly turn the dial to any number. Before taking the clock back tell the spectator to turn the dial backwards to prevent you from knowing the selected number. Take the Magic Clock back and immediately tell your spectator his or her selected number! Plated. Enjoy!